At your request we design and manufacture lighting fittings that will correspond with your interior and your needs. Sale of restored antique period lighting fittings of all the architectural styles and types of chandelier, lamps, wall lamps, lanterns, sconces, lamp posts etc. The electrified lights and lamps are provided with the electric installation audit report. Restoration of period lighting fittings and metal objects from ancient monuments (restoration plan, restoration research, restoration, restoration report). The team of our experts offer their long-term experience in the area of lighting of interiors of castles, palaces, luxury hotels, conference halls, luxury apartments. We provide a complete solution to the lighting of buildings including lighting of the sanitary and technical facilities. 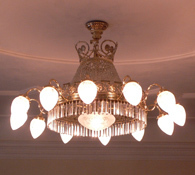 Rental of period lighting fittings (for film and other purposes). The lights and lamps are provided electrified or non-electrified depending on the client’s request. The electrified ones are provided with the electrical installation audit report. The rental can be inclusive transportation and qualified installation. The portfolio of the items to rent changes continuously. If you are interested in our current offer, please contact us. The rental prices are negotiable and depend on the type of lamp and the rental period.